Accounting rarely makes any marketer’s Top 10 list for enthralling must-reads, but if you have a loyalty program, or are contemplating one, sharpen your pencils and grab your pocket protectors. In Part 1 of this 3-part Brierley+Partners’ Mind the GAAP series, we’ll summarize the accounting changes, potential impacts to your bottom line, and reporting needs. In Part 2, we’ll highlight some examples of how these changes are impacting several leading programs’ financial statements. And in Part 3, we’ll share some best-in-class strategies and tactics to maximize loyalty program results in this new era. Until recently, there were two different ways to account for loyalty programs. As the illustration below summarizes, prior to 2018, most US companies following Generally Accepted Accounting Principles (GAAP) set by the Financial Accounting Standards Board (FASB) used the “incremental cost” method. Under this method, points were reported as a marketing expense (estimated incremental cost of loyalty currency awarded), and all revenue was recognized at the point of purchase (when points/currency was earned). Meanwhile, most companies outside of the US were following the “deferred revenue approach” under International Financial Reporting Standards (IFRS) developed by the International Accounting Standards Board (IASB). Under this approach, loyalty currency earned was treated as a separate component of the sale and revenue was deferred (liability) until the underlying reward was redeemed or the points expired (revenue recognized). The two accounting standard organizations representing the US (FASB) and international countries (IASB) reviewed the 2 approaches and agreed to adopt the “deferred revenue approach”. 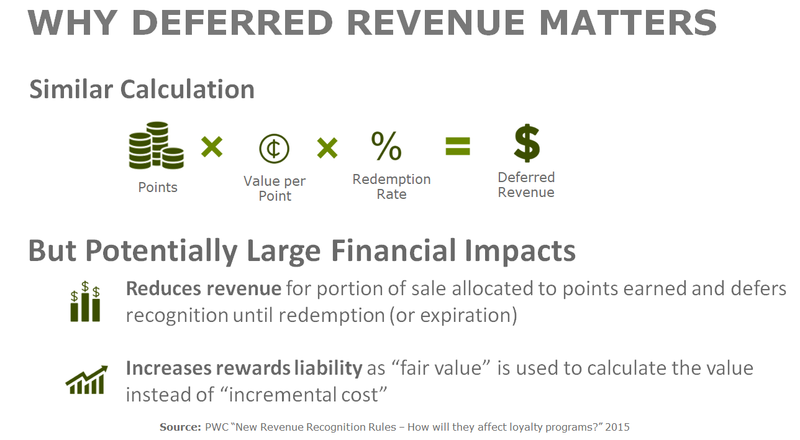 Starting in 2018, US companies (private and public) are required to use the “deferred revenue approach” to account for the financial impact of structured loyalty programs. By now you are saying to yourself, “this is why I slept through all of my accounting classes.” So what does this mean? Why does it matter? Hang in there. The end result of these changes differs depending on multiple factors, but in most cases, there is a potentially short-term adverse financial statement impact as revenue must now be reduced/allocated to the loyalty currency issued with each transaction and deferred (now based on “fair value” of points issued) – reducing revenue (and hence earnings) and increasing the liability for deferred revenue. Points Accounting/Rollforwards: Provide historical monthly recap of points earned, redeemed for rewards (and points expired from issued rewards, if applicable), points expired, and points balances. -These reports/dashboards should be tailored to specific brands, customer segments, tiers, geographies, PLCC vs. non-PLCC members, and other criteria. NOTE: In cases of individual point expiration, best practice is to expire on a First-In-First-Out (FIFO) basis, to maximize the time available for members to redeem, and minimize potential negative feedback and friction. Breakage Estimate and Forecasts: Ideally, forecasting of breakage, earn and redemption is based on linear or multivariate time-series regression leveraging multiple years of historical points data. Frequency of these reports can range from monthly to quarterly. Point Valuation: Though point value calculation varies by program, and can range from simple (i.e. $10 reward certificate = 1000 points) to complex (20,000 points = coach fare on any US airline) Brierley has developed an analytics-based approach that integrates at any point within our clients financial, revenue management, and reporting efforts. -Changes in partner redemption alternatives, point redemption levels, underlying value of partner-supplied rewards. -Changes in program including but not limited to elite tier qualification, points expiration, reward issuance and expiration, and acquisitions/divestitures. -All of the above metrics (and other unique factors) impact and inform the ongoing forecasting of key estimates of breakage and in turn, point valuation and revenue recognition. -Assumptions should be reviewed and updated at least quarterly, if publicly traded, timed with issuance of 10Q, but at a minimum annually. In this initial installment, we’ve provided a high level review of the changes in accounting rules that impact how structured loyalty programs’ contributions impact your company’s financials. In Part 2, you’ll see how the new rules have impacted some leading programs. 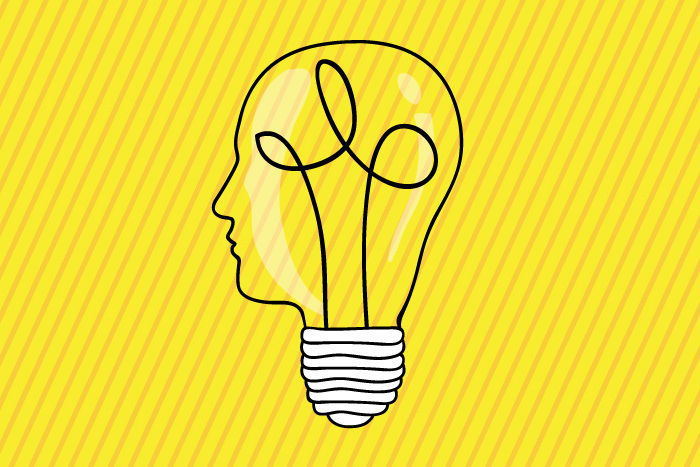 And last, but not least, in our final installment of Mind the GAAP, we’ll dive deeper into some best in class examples to show how to further maximize your loyalty program’s financial contribution and impact!